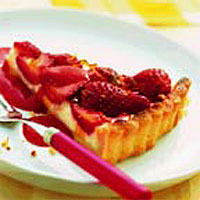 This lightly caramelised strawberry tart and coulis need to be made a few hours in advance, then chilled. As there is no last minute preparation, this makes it a suitable dessert for any occasion, from a casual lunch gathering to a formal supper. Preheat the oven to 200°C, gas mark 6. Thinly roll out the pastry on a work surface lightly dusted with flour and use to line a 23cm round, 2cm deep, loose-bottomed tart tin. Trim off the excess pastry. Line with baking parchment and baking beans. Bake for 10 minutes until the pastry starts to colour around the edges. Remove the paper and beans and bake for a further 10 minutes. To make the coulis, blend 125g of the strawberries in a food processor until smooth. Transfer to a bowl and stir in 2 tsp of the sugar. Chill in the fridge until ready to serve. Beat the mascarpone in a bowl until softened. Mix in 25g sugar, gradually add the lemon juice and cream, and beat until smooth. Spread onto the base of the cooled pastry case. Cut the remaining strawberries in half, if large. Scatter them on top of the mascarpone mixture and press them down gently. Preheat the grill to high. Sprinkle the remaining sugar over the strawberries and grill for about 4-5 minutes until the surface is lightly caramelised. Cool and chill for 1-2 hours until set, and eat within a few hours. Serve with the strawberry coulis. Watch the tart closely while grilling as it will brown quickly once it starts to caramelise. To avoid the pastry shrinking during cooking, line the tin with the pastry and chill before cooking. Take care not to burn the pastry edges under the grill. If it is in danger of becoming too brown, protect the edges with foil. Add 1 tbsp brandy or orange liqueur to the strawberry coulis.